Kyla knows nothing about who she is, where she's from, and what she cares about. She's been Slated, her memory and personality wiped, for a crime she doesn't remember committing. She's being given one more chance with a new family, and she cannot mess it up. Her new sister is nice, but her new parents are harder to read. Everyone keeps reminding Kyla not to mess up her last chance, but she has too many questions—about how the government operates, why teenagers she knows are disappearing, and her errant thoughts and feelings. Kyla is not supposed to remember anything from her past, but can you ever truly forget who you are? Teri Terry will draw readers into her dark and dangerous world in just a few pages. Kyla is experiencing everything for the first time again, and she's discovering everything about her world along with readers, which makes for an intense and suspenseful reading experience. Her new family presents some interesting mysteries; her father and sister seem welcoming and happy from the start, but her mother is short-tempered and she holds many interesting political and personal secrets. Kyla's new schoolmates don't always react well to her Slater status, and Kyla soon discovers that no one in her new life is as they first appear. As she forges new relationships and begins asking questions, she is drawn into dangerous world...one that she seems to be oddly prepared for. Terry intersperses random fragments of memory into the narrative to racket up the tension, and the book takes some frightening and unexpected twists. However, the story seems to fall apart toward the very end, and the ending is anticlimactic and without many answers. If readers can look beyond this and wait for the sequel that is most definitely in order, then Slated is an excellent and mysterious read. Cover Comments: I like the darkness of the cover and the city skyline. It fits will within the context of the story, and it looks enough like our world to be creepy and familiar. 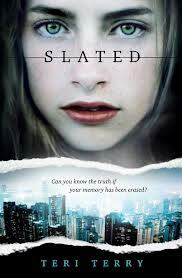 Slated will be released on January 24th, 2013. Aww too bad about the ending the concept of the book sounded really good. What a concept, sounds interesting! Thanks for posting this, first I've heard of this book.